Communicating over ftps with a bank - they require ftps with username and password, plus require installing a x509 cert on the client (they provide this cert). Can't find anywhere in WinSCP to install certs or assign cert for use with a specific ftp site. Is this possible? Sorry, we do not give any dates. It will take a few weeks definitely. We can provide you a development build for testing, if you are interested. Have the same issue. Please help. It was not released yet. I've sent you a dev build. May I also please request a copy of the DEV build with Certificate support. I also have a requirement for this feature. Could you kindly send me a copy of the DEV build with Certificate support too? We want to attach client certificate with WinSCP for file uploading because client network do not allow anything to go out without that client certificate. Could you please help us or let us know if you have released the newer version of WinSCP which supports client certificate. Do you have any sample code with you for how to attach the certificate with WinSCP session. Thanks prikryl, but I am not able to find given property "TlsClientCertificatePath" with WinSCP576automation. However is there any way to attach certificate directly as we don't have path of certificate with us, we have to pick installed cert by its name provided from machine. We do attach the same to web reference like "WebServRef.ClientCertificates.Add(cert)" where cert is the X509Certificate object. Could you please help us for this. Found given property in WinSCP 5.8 Beta. Could you please help me with my another query, is there any way to pass/attach certificate by object and not by path. The .ppk file is not FTP TLS client client certificate, it's SSH/SFTP private key file. 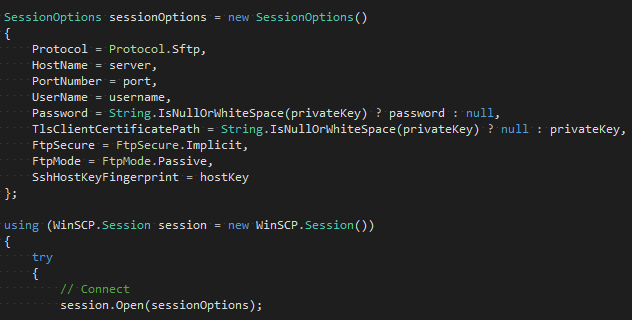 Use SessionOptions.SshPrivateKeyPath. Have you published any example powershell code for this please?